London is a treasure-trove of all those beautiful things created by the minds and hands of humankind since the beginning of history. Wherever one goes in London, one has a strong feeling of living history. London is rich in history and equally rich in antiques and works of art. One of the biggest fine art trading centres of the world, London not only has some of the greatest art galleries and auction houses, but is also enriched by some of the most stunning private art collections in its stately homes and palaces. We have been fine art consultants and art dealers since 1987, and we were among the very first to establish our art presence on the Internet, in 1998. Then, recognizing the convenience of new technology, we believed in saving you time, energy and the sheer inconvenience of moving around an increasingly congested city. During the past 14 years, Artlondon.Com has evolved and has become one of the Internet's premier International Contemporary Fine Art Galleries. You may want to have your portrait painted by one of our top International artists as represented through our Portrait Gallery. You are welcome to sit for this, or our fine artists are equally happy working from your photograph. At ArtLondon.Com we believe in using the technology of the future to help you access the treasures from around the world which are waiting to be discovered. We are looking on developing in the very near future, a fully online art auction facility, enabling you to place bids from the comfort of your own desk. ArtLondon.Com is committed to creating a definitive, exciting 24 hour on-line, all year round, International Contemporary Fine Art Fair. Artlondon.Com is one of the most frequented sites of its kind on the Internet.. Our high visibility on the Internet makes it an ideal advertising site for art dealers and art galleries. We are shortly launching a press and publicity campaign which will increase our net traffic manifold, making our popular site the perfect outlet for your advertisement banners. From art news and views on current exhibitions to the latest fads and trends in the contemporary art world, make ArtLondon.Com your gateway to the world of fine art. For more information about advertising with ArtLondon.Com, click here. 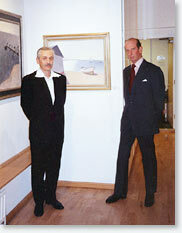 HRH The Duke of Kent enjoying our exhibition of paintings by major artist from Ukraine.